Alola Cousins!!! — I am ALL AGOG this week! Sandygast (in Japanese: スナバァ “Sunaba”) is a GHOST and GROUND dual-type introduced in Pokémon Suna and Moon’s Alola region (Generation 7). (See Bulbapedia for full descriptions.) Sandygast is basically a pile of sand with a shovel stuck in its head, as if someone would be digging in sand. It has a wide open mouth – caught in a perpetual scream perhaps? “Sandy Gasp” may be a good name as this Pokémon appears to be gasping. It is hard to ignore the big gaping hole in Sandygast. Is a hole in sand even possible? When ever I try to dig a hole in sand, it immediately fills in. If you could dig a permanent gaping hole in beach sand it would probably become some type of tourist attraction. 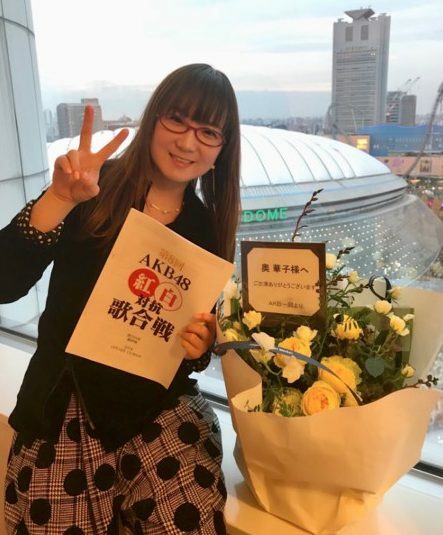 I have to wonder why she is “all agog” here … it is almost like she might be expecting something. I like this Pokémon, although I usually do not think about ghosts when I am on a beach. 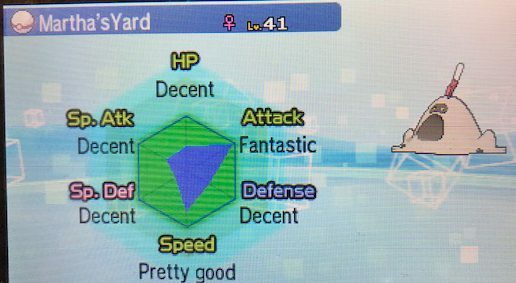 I understand why it is a ground type – but a ghost? When you are on the beach, do you think of Sun, fun, pretty girls in bikinis, the smell of coconut oil on the girls … and … GHOSTS? Really? 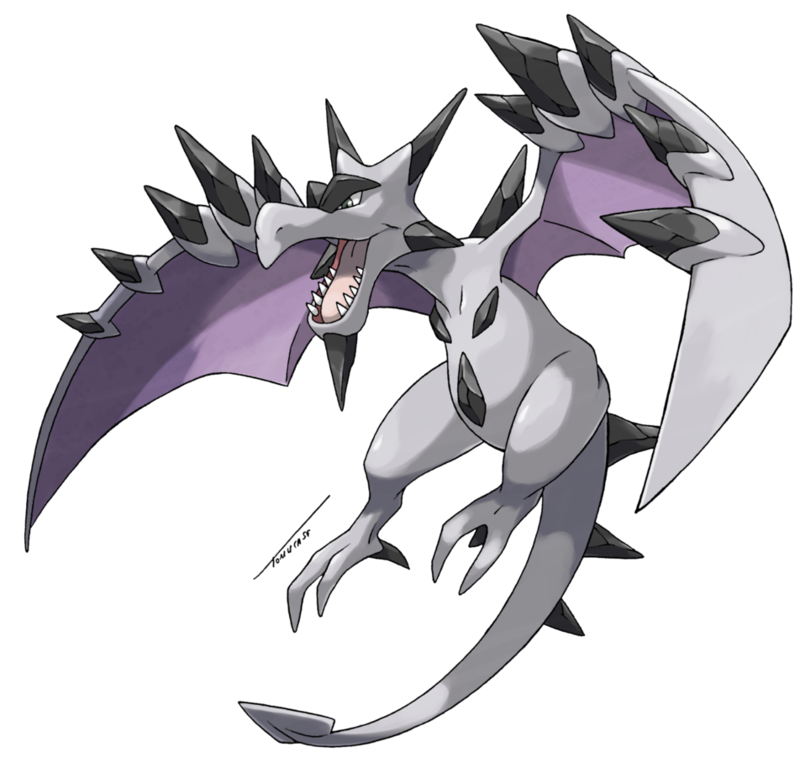 I like that this Pokémon is unusual, and it was just what the series needed. Sandygast evolves into Palossand (in Japanese: シロデスナ “Sirodethna”) starting at level 42. Palossand sounds like “Pile-of-Sand” but it is actually not an amorphous pile, instead it is shaped like a sandcastle. 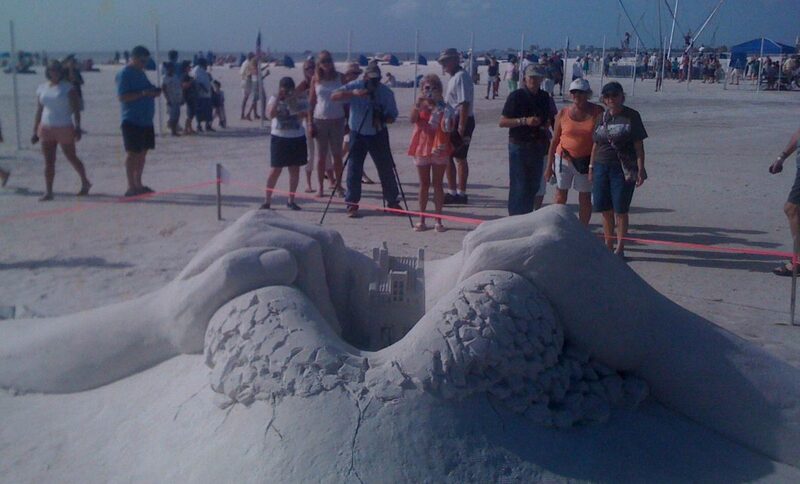 You can just name it “Sand Castle” or “MySandCastle” as that would be cute enough. I caught one in a timer ball, and named it “Sands-o-Time” … which is clever, don’t you think? My favorite Sandygast/Palossand nickname is “GoPoundSand!” which is of course, an alternative way to say “F*ck off!” without actually swearing. The name “Sand Trap” or “Sandy Trapp” might be good, as “traps” are apparently popular these days. 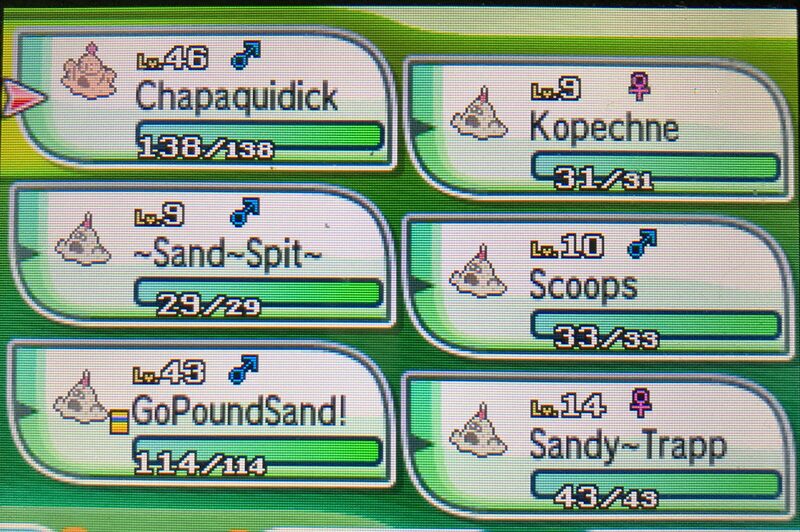 Something very cool about Sandygast and Palossand are that the shiny versions are black. This is because volcanic sand is black. 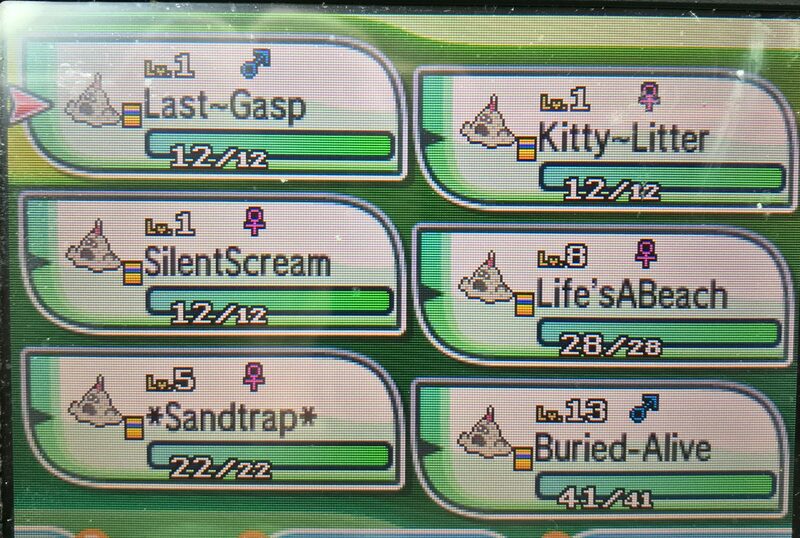 If I ever catch a shiny Sandygast I will name her “Black Beach“. I also like to use names which ahve to do with sand and/or other famous sand spit features. The name “Cape Cod” might be good, as that cape is one large sand spit feature. I also like to use the name “Martha’sYard” for a Palossand. There is not enough room to write out Martha’s Vinyard due to the 12 character limit. The island is noted for being the home of the “Kennedy Compound” which housed the famous Kennedy clan, including the late President John F. Kennedy. Another ghostly suggestion is “Chapaquidick“. Yes, I know that the island is really spelled Chappaquiddick but I am limited by the 12-character length. Most people associate the name with the car accident caused by the late Senator Edward “Ted” Kennedy, in which a young woman — Mary Jo Kopechne — was killed. Of course the young lady did not die when the car drove off the bridge. She survived the crash, but did not drown either. She was trapped under the car in the back compartment, and ran out of air. Kennedy left the scene, and did not report the accident until the next day — thus he was directly responsible for the young woman’s death. He was only concerned with his career, not for the state of the young woman he just had an affair with, and then left to die. 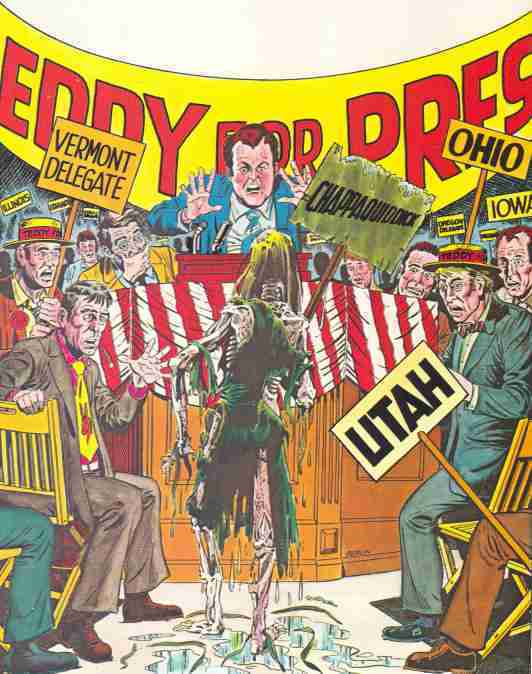 “The Delegate from Chappaquiddick” original artwork appeared in the National Lampoon. You could name your sandy ghost “Mary Jo” in reference to the poor young woman who was left alone to die by Senator Kennedy. Do you have a sandy ghost or gaping hole story? Please comment! 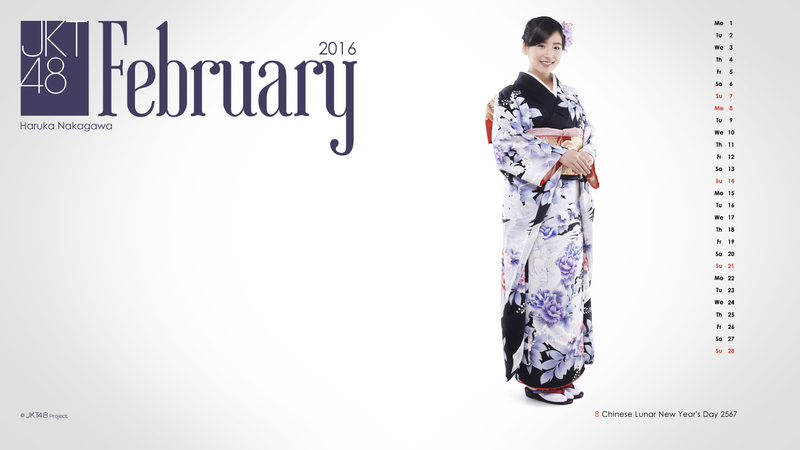 Kimonos on Monday: Photos of my Iwasa Misaki concert DVD covers and insert booklets. There’s certainly something supernatural about this critter. When I go to the beach I findthat sand gets in every single hole.